Your child faces one tough decision. They’re on the path to becoming the greatest Stormtrooper ever… and it all comes down to this. Do they track down the Rebel Scum or do they cozy up on the couch for some cartoons? On the one hand, Luke Skywalker and Han Solo need to be captured for the Galactic Empire to thrive, but on the other hand, your child could also use a little bit of rest and recovery to make sure they’re feeling recharged! The good news is that your young Stormtrooper can be prepared for both possibilities when they have the right outfit. Yes, this Star Wars Stormtrooper comfy throw is primed for both dangerous missions and lazy days on the couch. It’s designed with the needs of any young trooper’s needs, doubling as both a great costume and as a warm blanket to use at night! This wearable blanket is made of an extra comfortable fleece material. It has sleeves and a large opening in the bottom for their feet. Your child can toss it on over their normal clothes or over their pajamas. It keeps them warm when they cuddle up, but that’s not even the best part. The best part about this comfy throw is that it has a full suit of Stormtrooper armor printed on the front. 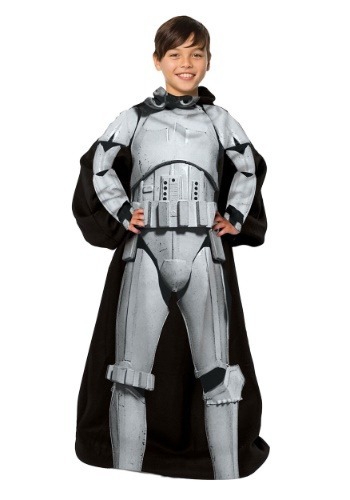 From the chest to the feet, it will look like your child is a member of the Galactic Empire’s finest soldiers. This Star Wars blanket is perfect for costume-themed sleepovers or any costume party where comfort is important. Since this throw doubles as a blanket, your child can continue using it keep comfortable all through the winter. We bet all of the real Stormtroopers in a galaxy far, far away will be quite jealous of your little soldier!